If a library buys less books then people take out less books. If a library does not have enough money to properly maintain itself, people don’t come in. That appears to be what is happening this year, according to the 2011 CIPFA Public Library Statistics. Some things are striking. 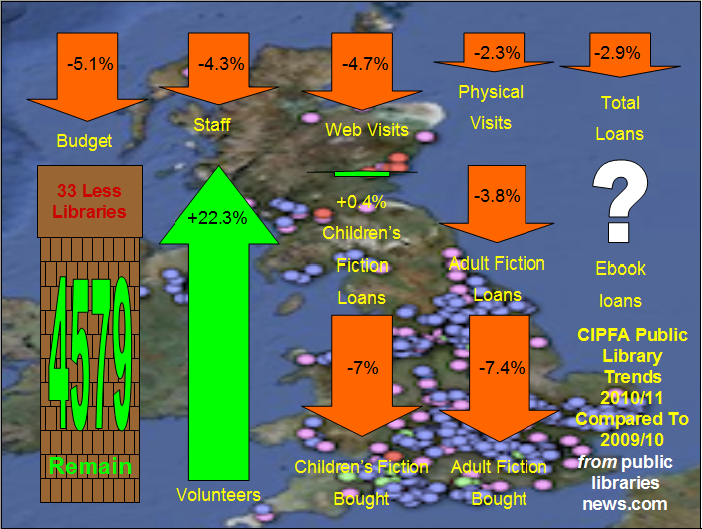 Very few libraries have been closed but the figures show that the service has been “hollowed out” in other ways. Almost one in twenty staff have gone for a start, replaced in part one suspects by the large increase in volunteers. A ray of hope is that children’s usage has actually gone up despite cuts in funding. This is probably due to the wonderful Summer Reading Challenge and BookStart initiatives, showing the importance of promoting library services. We don’t know, also, what impact Ebooks have had as those figures have not been gathered long enough to be released. That sector will doubtless show big increases in future years, although it is highly doubtful whether it has in a significant way replaced the decline in the borrowing of printed books this year. It’s sobering to think that these figures don’t show the full impact of the first year of the cuts. They show the first half of the year when councils were still coming to grips with what to do. There is a lot more pain to come. A lot more downward arrows. Ed Vaizey and Jeremy Hunt are presumably hoping that those arrows will not end up pointing at them. CILIP Gothic – Wordshore (USA). Describes challenges for CILIP and for public libraries generally. Useful to read for background on the difficulties facing the librarians’ professional body. Culture Secretary under pressure over library closures – Xmedia. Summarises legal actions and other protests. Describing and measuring the value of public libraries: The growth of the Internet and the evolution of library value – First Monday. “n the current economic climate, public libraries find themselves in the position of defending and justifying their funding and continued existence to their stakeholders….” Detailed academic report. Hard choices: do libraries really destroy books? – NPR (USA). Examines issues around disposal of older/less desirable books in libraries. How one library system was transformed on a tight budget – Guardian (Public leaders network). “Anythink Libraries in Denver, Colarado, have quadrupled circulation and visitor numbers in seven years by connecting with users and raising its own levy”. Previously poor and low-funded – floor space now tripled. “Two key models of inspiration for this reinvention are London’s Idea Stores and the Apple store. All Anythink’s new libraries are designed for comfort, intuitive browsing and self-service. This allows staff to focus on hospitality, gracious service and creating connections with people, information and programmes.” Increased ebook/digital provision. 110 full-time equivalent staff over seven branches. Library is everywhere – Info Today. Key themes from Internet Librarian International 2011 Conference. Privatizing public libraries is a bad idea – Outlook (USA). “One of the most attractive components of public libraries is the notion that everyone, from any social and economic strata, has equal and unrestricted access to books, periodicals, movies and online resources.”. In response to libertarian thinktank proposal to charge users for libraries. Opening hours of Norwich Millennium Library, most used library in the UK. Further falls in library use as book stock still suffers – BookSeller. Summarises changes in CIPFA figures. West Sussex – £650,000 cut over three years: via self-service, less staff, volunteers in smaller branches, £200k cut in bookfund, more donated books, stopping staffed visits to elderly peoples’ homes. Dudley – Outrage at bid to shift library – Dudley News. “Dudley Council wants to shift the [Netherton] library, currently based at Netherton Arts Centre, to the nearby Savoy Centre – a business centre run by Black Country Housing and Dudley Council. Netherton Arts Centre may close. Liverpool – Central Library redevelopment reaches halfway stage – Liverpool Echo. ““The library is one of the most celebrated public libraries in the UK and its regeneration will not only restore the building’s beautiful historic elements but will also create a 21st century facility for all library users.” Many pictures. Print article This entry was posted by Ian Anstice on November 2, 2011 at 10:23 pm, and is filed under Uncategorized. Follow any responses to this post through RSS 2.0. You can skip to the end and leave a response. Pinging is currently not allowed. “If a library buys less books then people take out less books”. “If a library buys fewer books then people take out fewer books”. Wow, libraries budget only went down by 5.1%? All this stuff about the library budget being hit worse than other budgets might be true in one or two councils but it is obviously complete rubbish for the country as a whole. Staffing down a mere 4.3%? Hardly enough to justify the squeals coming out of CILIP. Libraries are actually doing quite well compared to some other services. An inconvenient fact for many, no doubt. The cuts are being disproportionately levelled at libraries in some councils, Anonymous. So, some are facing a 20%, 30% or 50% cut. Look at the “Tally” page to see cuts in pounds, where known, by council. Some councils is not all. And disproportionate cuts are not in themselves bad. Should a council levy the same level of cut across all of its services? Of course not. Of course the slash and burn is to be regretted and opposed, but even here it comes back to the age old adage: if not libraries, then what DO you cut? Because cut you most surely have to. No-one claimed all councils were closing libraries. Libraries are normally 1% or so of the overall council budget. A large (“disproportioinate”?) cut to them may have a drastic impact on their users but not really solve any other council problems. See my page on saving money without closing libraries for other ideas, of course. Let’s make this clear. No librarian or campaigner I have ever seen has ever said libraries should be immune from the cuts. That would be, as you suggest, of itself unfair. What library users and campaigners do want is a fair crack of the whip, not to be seen as a soft and easy option. Not to be seen as a “luxury” service. The purpose here is to explain why we are not – again see another page on this site, the “reasons for public libraries” page. Let’s make this clear. Rolling over and dieing is not fair to those who use public libraries. We need to advocate our case, as surely every other service is doing, or we will be as certainly being unfair in quite a different direction – as libraries needed by so many would be completely destroyed within the next couple of years.